Related chairs with legs headed by heavily carved acanthus leaves bear the label of the Clerkenwell cabinet-maker Giles Grendey. A set of four side chairs and a settee from the suite were supplied to Gunton Park, Norfolk in 1740-45 and illustrated in P. Macquoid, A History of English Furniture: The Age of Mahogany, London, 1906, vol. III, pp. 122-123, figs. 104, 105. The present side chair differs from the Grendey suite by its scrolled feet and carving. The leaf-wrapped pad feet on the present chair relate to a pair of walnut side chairs, sold anonymously, in these Rooms, 16 June 1988, lot 91. A set of three with similar feet were sold by the Colonial Williamsburg Foundation, Christie's New York, 20 January 1996, lot 523. 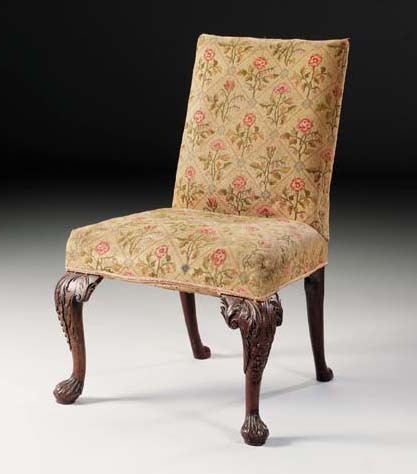 A further similar single side chair with almost identical backswept rear legs, was sold anonymously, Sotheby's London, 13 May 1994, lot 56.